"For my very first day in union construction I was sent to a bank in downtown Boston where a journeyman needed a hand pulling wire. Arriving early with my new tools and pouch, I knocked on the glass door in the high-rise lobby and explained to the guard that I was a new apprentice working for the electrical contractor. He refused to let me in. So I sat down on the tile floor, my backpack and toolpouch beside me, and waited for the man whose name I had written down alongside the address and directions on a piece of paper: Dan. The guard explained to Dan later that he'd figured I was a terrorist planning to bomb the bank. In 1978, that seemed more likely than that I might actually be an apprentice electrician. 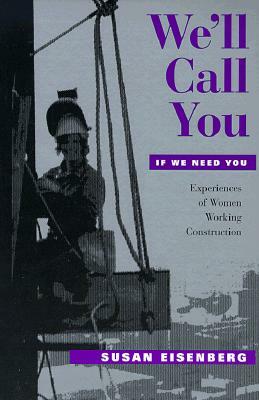 "Susan Eisenberg began her apprenticeship with Local 103 of the International Brotherhood of Electrical Workers in 1978, the year President Jimmy Carter set goals and timetables for the hiring of women on federally assisted construction projects and for the inclusion of women in apprenticeship programs. Eisenberg expected not only a challenging job and the camaraderie of a labor union but also the chance to be part of a historic transformation, social and economic, that would make the construction trades accessible to women.That transformation did not happen. In this book, full of the raw drama and humor found on a construction site, Eisenberg gracefully weaves the voices of thirty women who worked as carpenters, electricians, ironworkers, painters, and plumbers to examine why their numbers remained small. Speaking as if to a friend, women recall their decisions to enter the trades, their first days on the job, and their strategies to gain training and acceptance. They assess, with thought, passion, and twenty years' perspective, the affirmative action efforts. Eisenberg ends with a discussion of the practices and policies that would be required to uproot gender barriers where they are deeply embedded in the organization and culture of the workplace.